Watching the retired space shuttles Discovery and Enterprise fly over the country on top of the NASA 747 carrier was pretty incredible event to see. If you didn't get the chance to see them yourself and find looking the images of the different flights make you wish you could command a space shuttle, now you can! At least, a DIY plush model of one. Instructables member Phydeaux created the space shuttle plushie concept after seeing the Discovery shuttle fly over with his family--it's a little like a like a commemorative piece. 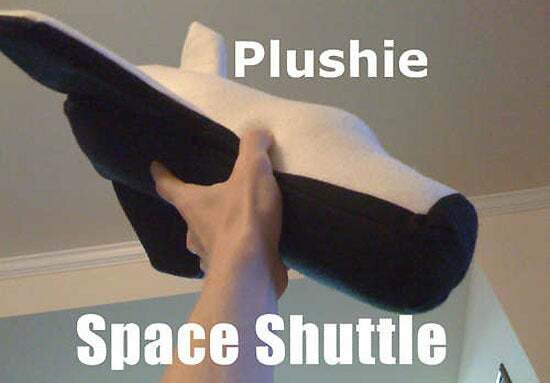 The project is simply a shuttle-shaped stuffed toy, made with lots a fleece and thread. This guide is great fun for both adults and children, and mainly requires a steady hand and a lot of shape tracing. After you cut out the basic shape out of the fleece, start sewing the shapes carefully together, and remember to reinforce the wings of the shuttle with something like foam. Once it's almost all sewn up, get stuffing! Stitch up where you just stuffed and voila, a pretty cool shuttle plushie. Get the full step-by-step guide on Instructables. You could further Phydeaux's basic concept by adding more details, such as windows or logos. Either way, I'd love to launch this across my room a few times, and it totally trumps the typical stuffed animal toy.